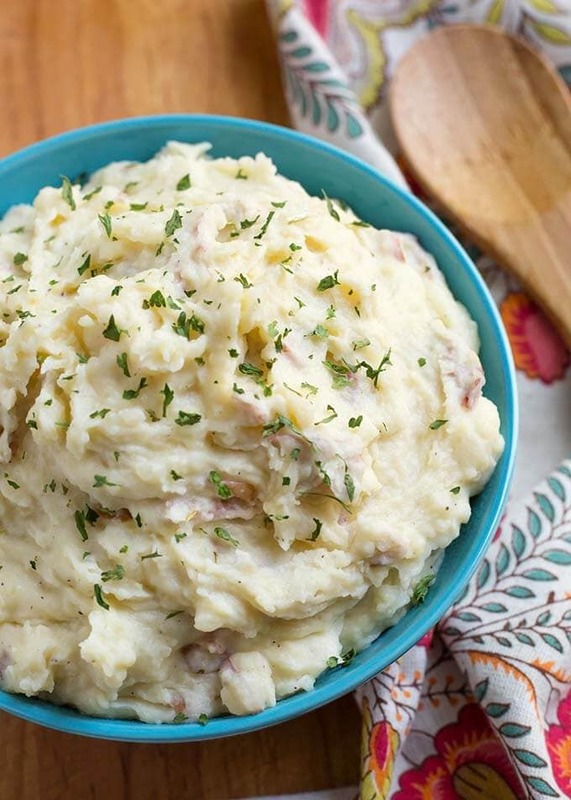 Instant Pot Creamy Mashed Potatoes are the perfect side dish. If you are in the mood for something a little more special than basic mashed potatoes, you can kick them up a notch with some simple, yet delicious, ingredients. These pressure cooker creamy mashed potatoes are my family’s favorite, and so easy to make! They are also a great Instant Pot Thanksgiving side dish! We love eating potatoes in our house. None of my family has ever complained of having them too often. 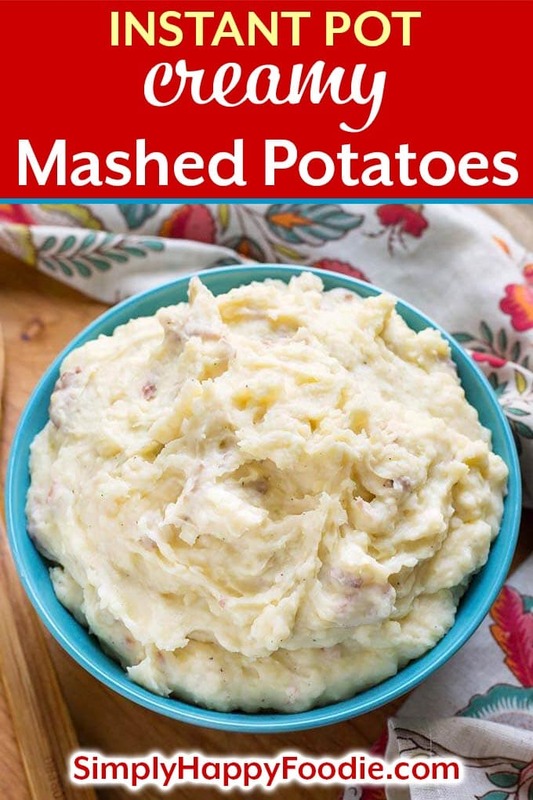 When it comes to making mashed potatoes, I love to cook them in my Instant Pot! I used to just make a basic recipe, but these are so good we have them almost exclusively. 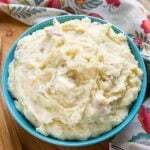 This pressure cooker mashed potatoes recipe can be made to be creamy garlic mashed potatoes, or leave out the garlic to just have the creamy mashed potatoes. 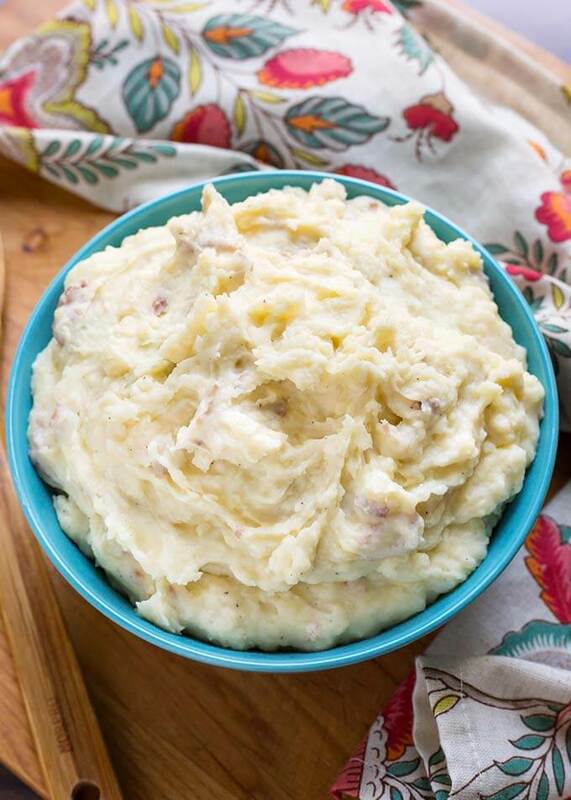 Another great reason to make this Instant Pot Creamy Mashed Potatoes recipe is that it is a “dump and push start” style of cooking in the Instant Pot. It is very easy, with no pot of boiling water to drain. Dump in the ingredients, close the lid, and start it up! You don’t have to peel the potatoes if you don’t want to, I rarely peel mine. Just scrub them really well if you aren’t going to peel them. As you mash them, you may want to add some milk or cream to thin them a little, and add even more richness! If you want something tasty to go with your Instant Pot Creamy Mashed Potatoes, try my Instant Pot Mississippi Pot Roast recipe! The gravy is divine! Instant Pot Creamy Mashed Potatoes are a perfect alternative to plain mashed potatoes. Pressure cooker creamy mashed potatoes are delicious & easy to make! Cut potatoes in halves or larger ones in quarters. Add potatoes, broth, garlic, salt, pepper, butter, and cream cheese to the pot. Press the Pressure Cook (Manual) button or dial, and then the +/- button or dial to select 13 minutes. High Pressure. When the cook cycle is finished, turn the pot off and let it sit for 5 minutes. Then turn the steam release knob to the Venting position to release the pressure/steam. When the pin in the lid drops down, open the pot and use a potato masher to mash up the potatoes to your desired consistency. Add the half and half or milk a little at a time until desired creaminess is reached. Taste, and adjust salt as desired. 1. 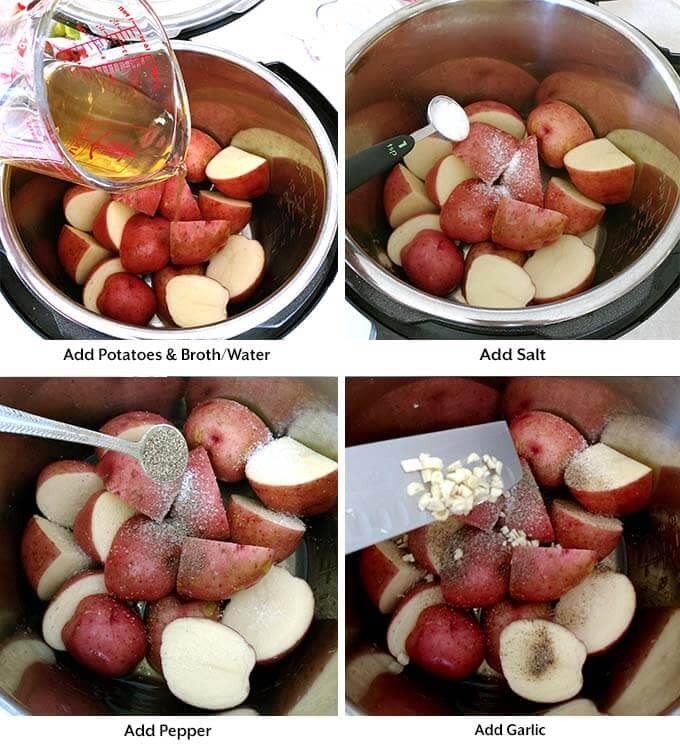 I like using red potatoes. They have a nice flavor, and a bit of a heavier consistency. Use gold or russet for a fluffier texture. 2. The garlic is optional, but add a lot of flavor. Use less than 3 cloves if you don't like a strong garlic flavor. 3. Use water or veggie broth for a Vegetarian version. *If you increase the amount of potatoes, also increase the amount of all ingredients except garlic (use 4 cloves), including broth. 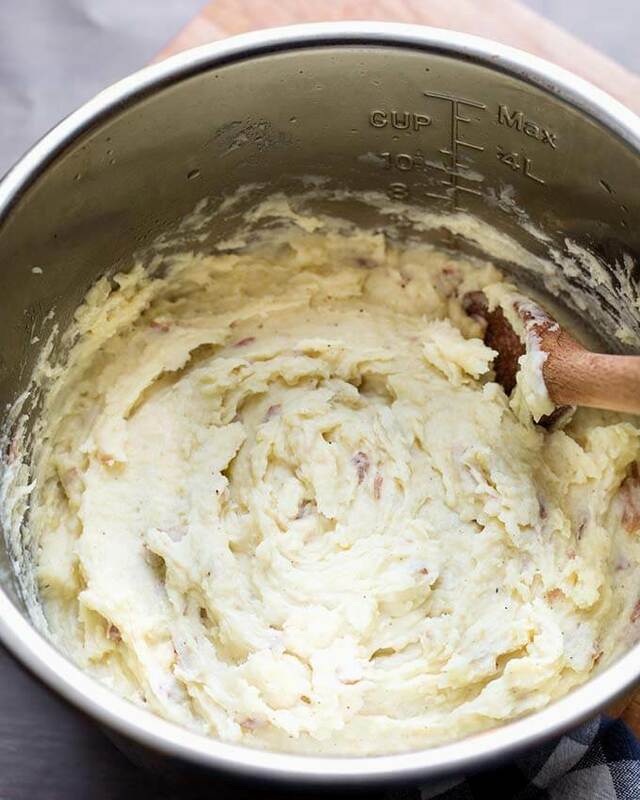 Oh my goodness these are the best mashed potatoes I have ever made! Thank you for this recipe! Hi Pat! 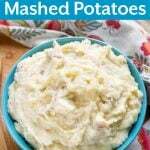 I’m so happy you like this mashed potato recipe! Thank you for your review! Just made these potatoes in my IP. These are the BEST mashed potatoes I have ever made! I have tried lots of recipes and methods but this was the easiest and creamiest. I used 3 lbs of Russets with skin on. I added 1 cup of water. And I used low fat cream cheese. Turned out great. I didn’t even need to add the milk. Thank you! I’ll definitely be checking out more of your IP recipes. That’s great, Susanne! I’m so glad you liked this recipe! Thank you for your review! If i am making 5 lbs of potatoes should I increase the liquid, creqm cheese? 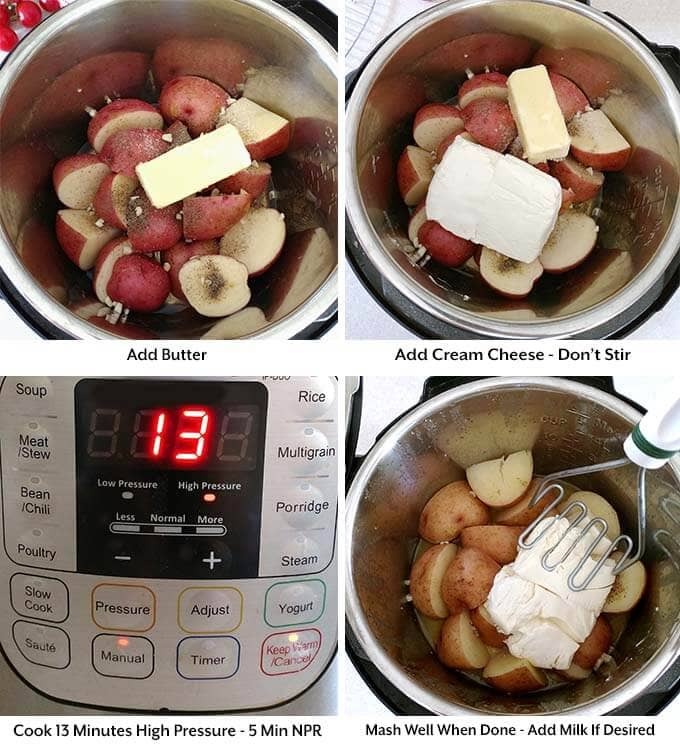 You can increase the cream cheese and butter. I would add 2/3 cup more water or broth. Then add milk/cream, or even sour cream, as needed. The timing should be the same too, right? Yes, the time stays the same. Thanks!! Going to try this for Thankgsiving 🙂 Happy Holidays!! I tried the recipe to use up some potatoes. I will be honest and say that I don’t really like mashed potatoes. These were delicious!! It is also so simple. Thank you for posting it. Can you clarify the liquid amount? Is it 3/4 c of broth and 1 1/2 c of water? Or is it the broth OR the water? It’s 3/4 cup of either broth, or water, if using a 6 qt pot. Increase to 1 1/4 cups of liquid if using an 8 qt pot. You may need to use less cream in the end, but mash them first and then decide. For a 5 lb batch, double everything except the garlic (try 4 cloves), liquid, (use 1 1/2 cups) and keep cook time the same. After mashing, you can add the cream a little at a time until they are as creamy as you like.